Beatrice Tinsley (née Hill) was a New Zealand astronomer and cosmologist who made remarkable discoveries about the evolution of galaxies. She was English born but raised in New Plymouth, and later studied at the University of Canterbury. In 1963 Beatrice and her husband, also a physicist, left for the United States, where academic opportunities were more fruitful. Beatrice completed her PhD thesis, Evolution of Galaxies and its Significance for Cosmology, through the University of Texas, Austin in 1966. She was the first woman to study in the astronomy department. Her research on the evolution of galaxies and changes in star populations was influential. She was the first person to develop a method of calculating star formation rates and the chemical evolution of galaxies, demonstrating the behaviour of galaxies over time. Before her research, astronomers believed galaxies were static or changed very little over time. 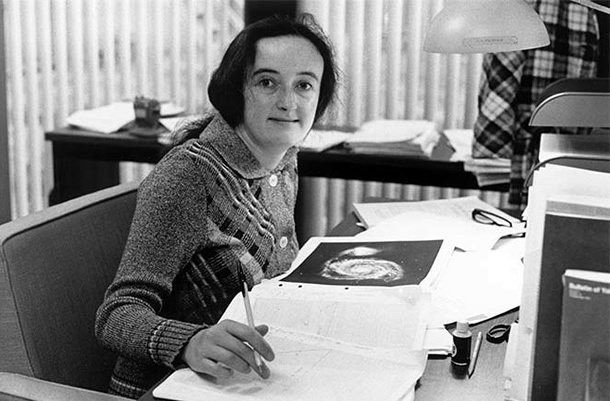 In 1978 Tinsley became the first woman to be appointed as Professor of Astronomy at Yale University. She published around a hundred research papers during her 14 year academic career and was the first female recipient of the ‘Annie Jump Cannon Award’ in astronomy (1974). Beatrice died on 23 March 1981 at the young age of 40 after a battle with melanoma. Following her death, her scientific contributions have become more widely-known and celebrated. One tribute is the ‘Beatrice M. Tinsley Prize’, established by the American Astronomical Society in 1986, which recognises outstanding research contributions to astronomy of an exceptionally creative or innovative character. We have 17 biographies, 4 articles, related to Beatrice Tinsley made professor of astronomy at Yale.